Cllr Lisa Parker, Rugby Borough Council portfolio holder for environment and public realm, and Colin Horton, Rugby Borough Council green spaces officer, at Hillmorton Recreation Grounds pavilion. Contractors have started work to demolish the pavilion at Hillmorton Recreation Ground. Built in the 1960s, the pavilion fell into disrepair and became a target for vandals – prompting residents and councillors to push for a solution. Cllr Lisa Parker, Rugby Borough Council portfolio holder for environment and public realm, said: “I’m delighted work has now started to remove the pavilion. In May this year Rugby council confirmed plans to demolish the pavilion, stating work would be complete by the end of October. Contractors started pre- work on site on Monday, November 26, ahead of fencing off the site and erecting scaffolding. The pavilion is now expected to be demolished by Christmas, while resurfacing work will go ahead in the new year. 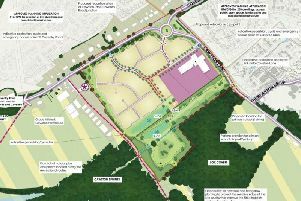 Rugby council said it plans to work with the community before making a decision to either replace the pavilion or develop other facilities at the recreation ground, such as play equipment, nature areas or an outdoor gym. Campaigner Jim Ellis said residents welcomed the news that work has begun on demolishing the pavilion, but said there have been difficulties in communication regarding the site’s future. He said: “The friends of East Rugby Group is delighted that the council has recognised the community-led campaign highlighting the health and social implications of the pavilion. "As a community group and activist, I’m keen to ensure the local community is consulted as to improving amenities.